Children learn how to prepare healthy foods in Wellness Foundation's W Kids program, which is run throughout public schools on the East End. This weekend Wellness Foundation in Sag Harbor will hold its 7th annual Summer Benefit. The event is sold out. But their programs are open to everyone. The foundation works to transform how people think about their health and how they maintain it. Wellness Foundation Program Director Jennifer Taylor says the foundation aims to create an area in the community where healthy living is affordable and available to everyone. Taylor recently spoke to All Things Considered Host Bill Buchner about the foundation and its work. Below is a transcript of their conversation. I understand it was students at the East Hampton Middle School who were the spark of inspiration behind the foundation. Can you tell us that story? Yes, that’s one of my favorite stories. I’ve been very fortunate to be with the foundation since 2006, just after our founder, Doug Mercer, founded the organization. 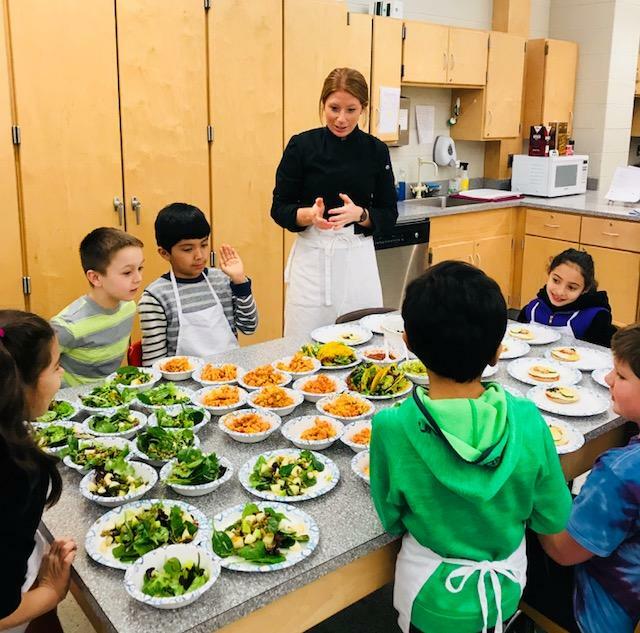 Ginny Reale, who was then the health teacher at East Hampton Middle School, decided to deepen the nutrition aspect of the Health program that year and teach the kids a little more than they normal did. And what happened was the children noticed the disparity between what they were being told they should eat and what was being offered at the school cafeteria. And so the kids, on their own, organized a boycott of the school food. And that got the attention of local media, but it also got the attention of the school district and the school service providers. One of the issues the school district cited for not being able to offer healthier foods was that they didn’t have the funding to have a refrigeration unit to store healthy, fresh produce. For example, salads and fruits and things like that. And Doug Mercer, our founder, read about it in the paper, and he donated the money for that cooler. But it also got him thinking. And he felt that if the students in his community could stand up for wellness that certainly he could too. That’s really why he founded Wellness Foundation and at this point we’ve reached over 15,000 kids over on the East End. And it’s really the kids out here that have been leading the way. Wellness Foundation has several programs like Wellness Challenge 360 and W Kids. How do these programs challenge adults and children to improve their health? As you mentioned, our W Kids initiative is in our public schools. From Montauk to Southampton. And we reach kids from preschool all the way through middle school, teaching them about the importance of plant-based nutrition, mindfulness, exercise, having a healthy body image. So that they can make good choices that will last for their lifetime. Schoolchildren learn the importance of eating whole foods. And then our adult program, we challenge adults to really concentrate on putting a whole lot of whole, natural plant foods into their diet, into exercising. And we ask them to eliminate things like sugar, processed foods and animal products because those foods are extremely inflammatory. So it gives your body a chance to see what it’s capable of when it isn’t hindered by those sorts of foods. And during that time our average participants lose about 10 pounds. Most people drop their cholesterol 35 to 40 points and usually they lose about 2 inches around their waist. And I think the most important thing that both initiatives do is to really help people see that they have a lot of control in preventing and reversing chronic disease in their body. 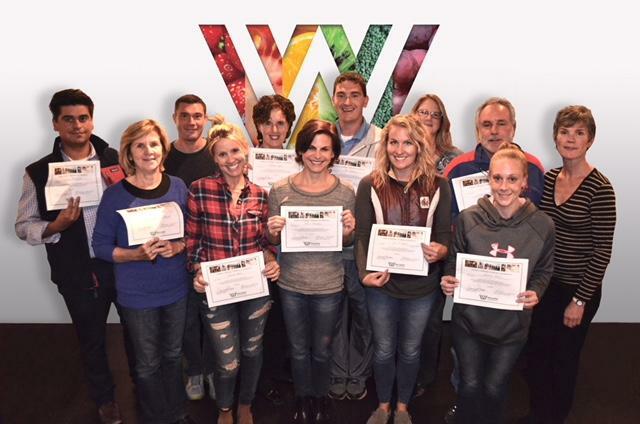 Graduates of the Wellness Challenge program stand with their completion certificates. You mentioned that you’ve been with the foundation from its beginning. Why did you decide to get involved? I have been passionate about nutrition and wellness all of my adult life because, when I was growing up every single person in my dad’s family was a Type 2 diabetic by the time they were 40-years-old. And it was just sort of normal in our family, nobody thought it was strange if you had to take insulin when you were 40-years-old. And I remember being in a health class, when I was in middle school, ironically that’s how this program started, and the teacher said that Type 2 diabetes was completely preventable. And I said, “What?” I didn’t know and I went home and I started exercising that day. I was in 7th grade, started working out every day. Started learning everything I could about nutrition. And I’m proud to tell you that my sister and I are the first two people on our dad’s side of the family to be over age 40 and neither of us is a Type 2 diabetic.